As Bono once said: "There's been a lot of talk about this next post, maybe maybe too much talk...". Well he almost said that once actually and it could very well apply to CrowdCall except for the "too much talk" part. It seems everybody's talking about CrowdCall and now that I've tried I understand why. CrowdCall is an amazing app/concept/service/idea which, like most great ideas, rests in its idiosyncratic simplicity (don't pay attention to idiosyncratic in the sentence... I just thought it would look smarter to add it in this post). So what does CrowdCall do? It actually does when it advertises for free: it lets you setup conference calls with up to 20 people anywhere in the world (mobile or landline). The only cost incurred is for the originator of the call that will be charged for a local call (but if you, like many others, have unlimited domestic calling, it won't cost you a dime). 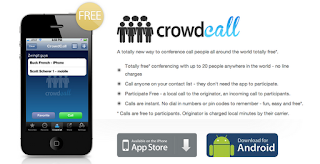 CrowdCall does not use VoIP but instead relies on classic telephone lines so call quality is excellent. CrowdCall effectively sets us free and it definitely is the next best thing to an All-You-Can-World cellphone plan! The app is simple in its execution, it is fast and what more can I say than stress the robotic prompt before being connected to the conference call that goes: "I love you for using me..."? CrowdCall opens the door to infinite possibilities. You can now call anyone in the world for free (the only limitation being the conference call nature of the service: to initiate a call, you need to call at least two numbers but only one need answer to connect you).